The Margarita has almost become America’s national drink. Mexican restaurants serve them by the thousand. BBQ joints serve them. I’ve been in Italian restaurants where the featured drink was a Margarita. And, no backyard cookout would be complete without a pitcher of the sweet and sour concoction. I can think of a few good reasons for this. When they are made well, Margaritas are strong enough to seem ‘serious’, sweet enough to seem non-threatening, and tart and cold enough to be refreshing. It’s a great summertime balancing act, and a drink that just seems to fit with hot days and grilling – regardless of whether the food being grilled is real Mexican, Tex-Mex, or burgers. I once spent the better part of an afternoon seeking out limes on Vieques island, PR, in order to make Margaritas, because the beaches and the food (and the guests) almost demanded them. It seemed a bit surreal that I was on a tropical island, with ample and cheap alcohol of every type, and couldn’t find a lime for the life of me. I tried all two grocery stores, and both bodegas with no luck. Not a lime in sight. I returned to the beach house, despondent and a bit sunburned from a few hours on a scooter. I did manage to learn an important lesson about Vieques though, talking to some ex-pats a few days later. There is a fruit truck. Not a truck that delivers fruit, like a milk truck or ice cream truck, but rather something that looks like an abandoned refrigerated tractor/trailer rig – but it’s not abandoned. The refrigeration works, and on most days they stock and sell a large variety of produce. Including the elusive Persian lime. If you are headed that direction, check it out and stock up – because on small islands the supply lines are often unreliable. I went through all this trouble, because fresh squeezed lime juice is paramount to a good Margarita. Frozen limeade (unless you are making a frozen ‘rita – which is a differnt drink, and a different story) won’t work, those little lime shaped containers of stabilized juice won’t work, Roses lime won’t work – it has to be fresh squeezed. 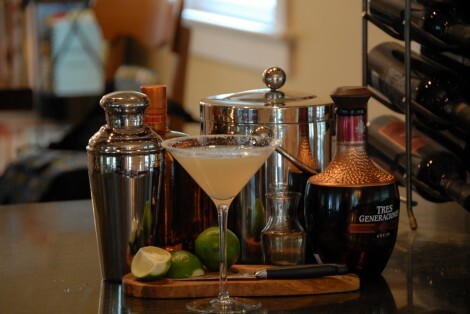 Citrus juices loose their flavor fast, and the only non-alcohol flavoring in a Margarita is lime juice. Plus, it only takes a little, so squeeze away. If you are reaching for that plastic handle jug of neon green ‘Margarita Mix’, please don’t. You’re doing it wrong. Here’s the ingredient list for an average mix:Water, corn syrup, sugar, citric acid, natural flavors, sodium citrate, sodium benzoate and potassium sorbate, cellulose gum, polysorbate 60, gum arabic, glycerol abietate and FD&C yellow no. 5. I’m not going to go for the cheap laugh here and say I can’t pronounce, don’t recognize, or don’t understand all of those chemicals – I can and do. Which is why I can say with certainty that I don’t want them in my drink. 1/2 part simple syrup. Or agave syrup. Or a teaspoon or two of sugar. Or skip it…. So, if you are making one margarita, each part is an ounce. 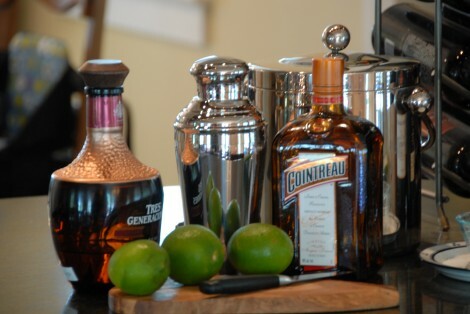 2 oz (60 ml) Tequila, 1 oz (30 ml) orange liquor, 1 oz (30 ml) lime juice, 1/2 oz (15 ml) simple syrup. If you are making 8, each part is a cup (240 ml) – if you are making 16, each part is 2 cups (480 ml) and invite me over. This yields a somewhat sweet, tart, very popular balance. If you discover that you like them a little less sweet, tweak the ratio and make it yours. Combine all ingredients in a cocktail shaker. Add 2 cups ice and shake vigorously for 45 -60 seconds. To serve up, strain into prepared cocktail glass. To serve on the rocks, strain over fresh ice in a double highball glass. The rims can be salted or not, based on preference. In fact, you can coat the rims with salt, a salt and lime zest mixture, a salt, lime zest, chili powder mixture – play around with it. One warning: Don’t use those huge, bell shaped margarita glasses for these – the ones that hold 12-16 ounces. There is 3 ounces of booze in each of these drinks, yielding a 5 ounce drink when served up (after shaking). If you try to fill one of those blue glass monsters, you will be on the floor by the second round. Here’s a video I made of the process….